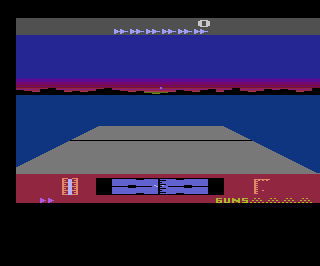 Radar Lock was Atari's answer to Sega's smash hit air combat game Afterburner. 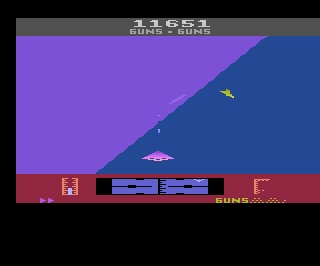 Although the 2600 had had no chance of duplicating Afterburners amazing visuals (in fact most home systems of the time struggled with Afterburner), Atari was able to come up with a similar (yet graphically simpler) game. Atari's secret was simple, they reused the Solaris engine. 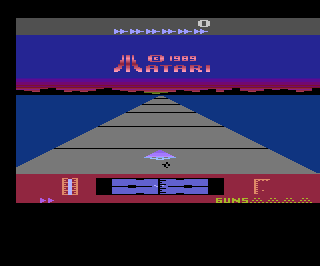 It's no secret that Atari was heavily into reuse of existing code, but Radar Lock may be the first time an entire game engine was reused. Apparently Doug decided not to mess with success, and modified Solaris into a new game. Although they may share the same engine, the games themselves are very different. Radar Lock is a mission based air combat game in which you control an experimental Delta Wing fighter armed with the latest weapons systems. The game is separated into three different segments: Take Off, Air Combat, and Refueling. This is the main segment of the game, and is where most of the action takes place. 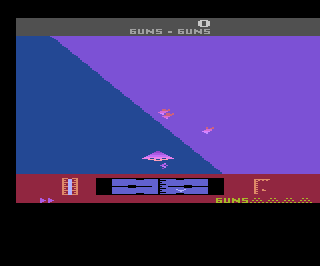 Unlike most 2600 games, Radar Lock makes use of both controllers. While this can seem a bit overwhelming at first, it actually becomes second nature after only a few minutes. Left Controller - The left controller is used for movement. Pressing left or right will cause your jet to bank left or right, while pushing up or down will cause it to climb or dive. Pressing the fire button will cause your jet to fire the selected weapon. Right Controller - The right controller is used for weapon selection. Pushing up selects machine guns, left selects guided missiles, and right selects proximity missiles. Pressing and holding down the fire button will increase your speed. Machine Guns - This is your main weapon, so you'll be using it a lot. You start out each mission with 2550 rounds of ammo, while this may sound like more than you'll ever need, you'll be amazed at how fast you burn through it. Machine guns will tear through just about any type of enemy except for Bombers. Bombers require 25 machine gun hits to destroy, so it's best to use missiles. Guided Missiles - Guided missiles are used primarily for taking out heavily armored Bombers. When an enemy is in range of your missiles, your radar will turn blue or violet indicating the enemy is in front (blue) or behind you (violet). Once the enemy us in range you must try and target him with the cross-hairs, if you succeed you will establish a lick and the cross-hairs will turn dark red. This is your cue to fire your missile and destroy the target. You start out each mission with 5 guided missiles. 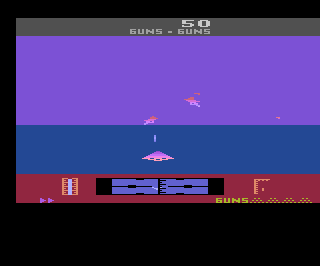 Proximity Missiles - Proximity missiles are a special use weapon which is only available in missions three, four, and five. Proximity missiles are launched by holding down the fire button, and detonated by releasing it. When a proximity missile is detonated it will destroy all the enemies on the screen except for Bombers. You only start out with 3 proximity missiles so use them wisely. The main screen shows a variety of useful information, which you will have to consult often. The gauge to the left displays how much fuel your jet has remaining. Fuel can only be replenished at the end of each mission, so make sure you complete your missions as fast as possible. Next to the fuel gauge is your short range radar which shows the positions of enemy jets on the screen. To the right of the short range radar is the long range radar, this radar show the position on enemy jets that are far off screen. Below the long range radar is your machine gun ammunition display, which shows how much ammo you have remaining. Above the play field is your missile display which shows how many missiles you have remaining. After completing each mission you will have to meet up with your midair refueling jet. To find the fuel jet, you must use your long range radar and quickly accelerate towards it. When you near the fuel plant it will let out a fuel hose, you must touch the nose of your jet to the hose to begin the refueling. If you successfully dock before running out of fuel, you will complete your current mission. Radar Lock is separated into five different missions. Each mission has a different type of enemy aircraft you must destroy. By destroying both waves of enemy aircraft and successfully you will complete the mission. Mission 1 - This mission is the easiest of the five. Here you get some target practice by destroying Drones. Drones are large red planes which are completely defenseless. After destroying all the Drones and refueling you will advance to the next mission. Mission 2 - On this mission you will encounter Interceptors and Patroller jets. Interceptors are the easiest of the enemy jets to destroy, and can only shoot targets in front of them. Patrollers are yellow aircraft which follow a set path, but beware they like to sneak up from behind. After finishing this mission you will earn a bonus life. Mission 3 - Mission 3 introduces the dreaded Bomber. Bombers are large white aircraft which are flanked by blue Escorters. Taking out a Bomber is a difficult task, as they are heavily armored and can shoot from behind. Use extreme caution when approaching Bombers. The second half of this mission features another wave of Patrollers. Mission 4 - Starting with mission 4 your jet now has the ability to roll. This allows you to move much faster to the left and right, however the enemy planes also start moving faster at this point. Mission 4 also introduces Steal Fighters which can block your long range radar. Stealth Fighters are quick and like to sneak up from behind, so use extreme caution when approaching them. Mission 5 - The final mission! This mission starts out deceptively easy with a wave of Interceptors, but then introduces the games ultimate enemy: The Super Bomber. Super Bombers are hard to destroy and are capable of firing massive missile barrages. The Super Bombers are also flanked by Patrollers, Stealth Fighters, and Escorters. By destroying all 5 Super Bombers you will complete the game. Radar Lock is one of the more impressive games on the 2600, showing just what this ancient system could do when pushed to its limits. Although it can be frustrating at times, Radar Lock is one of the best air combat games for the the 2600 and is a rewarding experience if you can get past the steep learning curve. While it may have been touted as Atari's answer to Afterburner, Radar Lock is more than another 'me too' clone and deserves its own place in Atari History.